I don’t know if the video I just watched-entitled “Amish Smugglers’ Shady Milk Run”–was intended to be funny, but I couldn’t help but chuckle. Technically, I guess you do call someone who brings in product to sell in an area where it is illegal a “smuggler”. But the term is such a loaded one. The quote in the video from the FDA (“Raw milk is inherently dangerous…it should not be consumed by anyone at anytime”) makes it sound like raw milk is a toxic substance that will make you grow a third eye or turn your skin purple. There may be legitimate health concerns. I don’t mean to diminish those. But I think that most raw milk drinkers would find the tone of the video laughable. The narrator’s voice is borderline campy (was it meant to be?). He makes it sound as if he is trailing a Colombian drug cartel and not a man selling a product people put on cereal. So if there is a serious point here, it seems a bit oversold. Maybe I’m off here. You can be the judge. The video is here (no longer online). I drink raw milk often when I visit Amish. In fact, I’ll be drinking it next week while staying with Amish friends in Lancaster County (not “Isaac” or “Samuel” from the video). Raw milk tastes pretty good. I don’t know about health benefits. I was also unaware of the threat of stomachaches, mentioned in the accompanying article. Perhaps our author is lactose intolerant. Perhaps it is rougher on the stomach than I am aware. Raw milk remains a flashpoint issue. 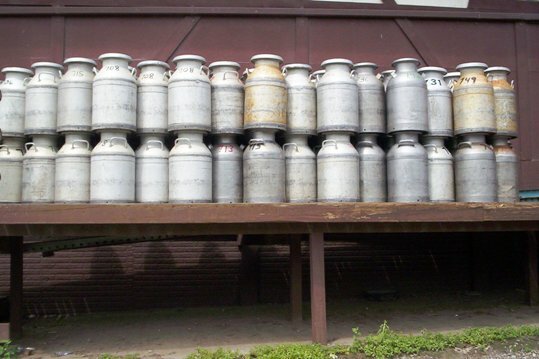 Raw milk sellers have been raided, arrested, and fined. But there is a market that wants it, despite the alleged risks. In the case of this news story, that market is found among “foodies” of New York, the final destination for the Amish smuggler’s product. 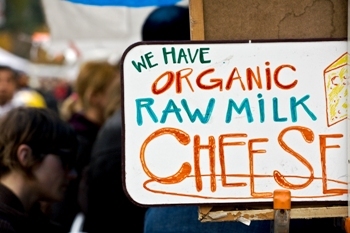 Anyone else have experience with raw milk? Is it dangerous? Should we be allowed to buy it? And more importantly–should I bring my own gallon jug next week, or stick with the straight-from-the-cow version? Good luck in life if you believe that crap. Umm, Ex Amish, by any chance are you a vegan? Where does this so called research come from? As owner of “ex amish.com”, I think I should trademark that term, and stop idiots like the one above from using it to try to deceive others into believing this idiotic “research”. Alice you are probably right, he has something wrong in the head to suggest that milk is puss. Joe, don’t let him get to you. There is one in every crowd, just wants to stir things up I suppose. Wow…How sad. First, I am not one to stir anything up. Although, education seems to be attacked here. And Joseph–Get real. Calling research idiotic? That is even sadder. Google it. The research is QUITE abundant. And yes, I am a vegan. I also believe in education. Hence, why I left my order. Try some before you attack someone who simply posted their beliefs. Hypocrite. So nice to have been judged and dismissed so viciously. I have not agreed with all either of you have ever written (I lurk often) and yet I have never outright dismissed. To esch his own. I grew up on raw milk for heaven’s sakes. I never said it will kill you. Although milk is far from healthy. Again, research it. And remember, live and let live. Just do so knowing ALL sides. Ignorance is not bliss and being Ex-Amish, I would expect YOU to know that better than anyone Joseph… Egads! Regardless of the response, Blessings to all…. This is not research, that is what is sad. This s just some guy wanting to make a name for himself and you bought right into it. “egads” in urban dictionary: It is a pagan way of saying omg. It comes from the saying “ye gods”, and, as everyone knows, the greek and roman gods had a way of messing with people’s lives. So when you say egads, in a sense, you’re saying “you f**kers,” but softly. "allowed to" have and actually have are two different things. In response to “Ex Amish”‘s posting in which, to support his claim that milk is unnatural and dangerous, states that milk has pus, blood and bacteria in it. He also states in his first post that “Milk is poison”. That is a pretty unequivocal statement. Milk is Poison, because it has pus and blood in it. First, Senor Ex Amish never does actually support his contention that milk is poison, but instead, only offers vague statements regarding -COMMERCIAL, pastuerized milk–. Note that in regards to this entire conversation, references are specifically to raw milk, which is completely opposite to commercial pasteurized milk. However, even ignoring that main difference, Ex Amish to support his contention that milk is poison because it contains pus and blood, then cites a statement that “Milk is allowed to have…” certain levels of pus and/or blood. Just because the FDA sets limits on how much contaminants are permitted, does NOT verify that each gallon of commercial retail pasteurized milk ACTUALLY contains these items. Note that these same standards allow a certain amount of spider parts in food items as well, but it does not mean that every, or even most, or even a majority, or even the median number of a food product ACTUALLY has a spider leg in it. These standards are only to legally allow certain contaminants at certain levels which are NOT HARMFUL (eg–NOT POISON) for human consumption because it would be impossible to eliminate all contaminants from all human food items. a. The conversation is about RAW MILK, but you are speaking to commercial, pasteurized milk, which is not related, except for tangentially. b. Your assertions that Milk (commercial or raw) is poison were not supported, even by your own cited “research”. Note that you actually cited that even the federal government notes that a certain amount of pus or blood or bacteria are PERMITTED (not actually IN, but permitted) due to the fact that they are NOT HARMFUL to/for human consumption. By stating that fact, you have not only NOT supported that milk is poison, but you have in fact, only proven that it is NOT poison. c. Your fallacious assertion that commercially available pasteurized milk has pus and blood in it, merely because of standards that do allow some trace amounts is not supported. You did not list/indicate any scientifically viable reports verifying that these amounts are ACTUALLY PRESENT in milk (either raw or processed). d. Your assertion that bacterium, fat, cholesterol etc is present in all milk is accepted as fact. However, the statement that these items are “poison” is not supporting by any of your assertions or cited “facts”. In fact, all of these components are vital nutritional items required by all humans. Note that we wouldn’t even be able to digest our food (yes even your holy green plants)without the teeming amounts of bacterium present in everyone’s digestive system. This is before even mentioning any of the other numerous bacteria in our bodies. In Conclusion, not only have you failed to support your assertion that milk is “poison”, you have in fact supported the exact opposite, namely, that milk is not only safe, but beneficial. Further, you have illustrated that your logic leaves much much to be desired and that you have not thought about or researched the subject at hand, although you are willing to be passionate about in your ignorance. As a result, I am left with no choice but to reject your claim that milk is poison and further, due to your lack of objective thought process, would be inclined to tend to disbelieve any future statements from you without solid, concrete, subjective facts up front. In summary, you clearly are wrong and don’t have any idea what you are talking about. You come back at me with a reference from the Urban Dictionary? Oh Joseph…Really? To be fair, my name is Eli Stoltzfus…I have no ill-will towards you but you obviously are different. Be well. I merely wished to educate. Again, so sad that ignorance still abounds…. Last thing I would like to say Joseph. Ex-Amish is something I am. Not something you own. Thanks for the completely offensive comment. It was this comment that really upset me but truth be told, I apologise for any unrest between us. I was very rude as well. I also know of you through Youtube and was going to send you something for your parents and would still like to. I really do wish you well. Communicating with other Ex-Amish has gotten me a bit riled up. Lots of memories. My apologies again…. As for the education, I do wish I was more educated, but I think I did fairly well with the self-education I gave myself. It is not disgusting…It is a heads-up. I like to know what I am putting in my body as do many others. It is also not made-up. It is fact. And yes, I stated, “Egads!” Just as “Good Grief” could have been used.. I would have ended with that but it seems that even Charlie Brown would be berated for it. Criminey!! And no, I did not say that you were not educated. I was speaking generally…. Think I was educated? I believe we have a lot in common but come from different states. I did not educate myself properly until after I left. I am in the ban now. Meidung…Another reason I left… I also hate that feelings and true sentiment are not easily conveyed through messages via the Internet. You were Swartzentruber, no? I would have hoped we actually could have been friends…. Yes I was, and we can be if you want to talk, email me. I think this has gone on quite enough. Ex there is just as much research out there that says the opposite. From what I have read, all of that info concerning pus in milk is mostly referencing milk from CAFOs consuming a diet of grain / other disgusting things and not from cows raised on a farm with enough green grass to go around. Yes, milk has bacteria in it. So does tea. So the door-knob to your office at work. So does the air you breathe. So does yogurt–that’s actually one of yogurt’s key selling points. I’m sure when God brought the children of Israel into the land flowing with Milk and honey, he wasn’t referring to some puss and blood filled so it has to be boiled to death first substance. Go back and reread your scripture brother. Raw Milk is better than pasteurized. Louis Pasteur said before he died that he regretted inventing pasteurization. Pasteurization breaks down the protein molecules into smaller pieces and therefore isn’t as healthy as raw milk. Some fairly heated discussion on here. Raw milk is legal in some states and not others. I find it odd that the feds would go after someone on such a diverse issue. I have drank raw milk in California and raw goats milk in Washington state. It comes down to people being allowed to make a choice when there is substantial research from both sides of an issue. I do get the feeling that the Amish are being singled out and that is sad. Lannea is right, it does appear that the Amish people are the target here. Well, I no longer drink milk because, as someone said above, I believe it is not natural. But, before that I did buy and use raw milk. It is fairly well known that pasteurization kills things in the milk that helps it to be digested. It is also well documented that some of these things inhibit our absorption of calcium. That is why the US has a much higher incidence of osteoporosis….much higher than cultures that don’t even consume dairy. That said…my father used to drive a milk tanker for “big dairy”. I can tell you from his word, that if the milk had too much puss to pass inspection they would dump a gallon or so of bleach into the milk…..problem solved. That is the main reason I quit drinking processed milk. I’m sure there is much, much, more of that kind of thing that goes on past the point of pickup. A recent study at Harvard University, done by an Indian doctor, found that pasteurized milk contains toxic quantities of estrone sulfate in it. Estrone sulfate is a compound that promotes breast, cervical and prostate cancer. Raw milk does not have this fatal drawback, plus, as the doctor also said in the study, raw milk has its own anti-cancer properties that the “dead” pasteurized milk does not possess. To the hostile vegan: I was a vegan for 14 years; and, a raw vegan for 4 of those 14 years. It helps for a awhile, and is a good “short-term” way to detox your system; but, in the long-run, it is a very flawed approach to nourishment, and causes most of its adherents major problems – that is why most people never stay vegan. I still don’t eat meat or poultry; but I do eat lots of fish and eggs; and, I drink GALLONS AND GALLONS of raw milk every week. I was drinking Pasteurized Skim Milk & LOW FAT Margarine for 15 years with my health decreasing and my body unable to maintain Calcium, Potassium, Sodium, Good Cholesterol, & High Triglycerides. I was taking twenty different medications. I finally went to see an Amish Doctor that advised me to drink RAW MILK and Use RAW BUTTER. My Calcium levels came back up after one year and my other levels improved. My Good Cholesterol, & High Triglycerides improved after stopping the LOW FAT Margarine which are made with vegetable oil and using RAW BUTTER. My Health is improving daily. I think we need more leaders like Dr. Ron Paul (Congressmen, and Presidential Candidate, TX) and his son, Dr. Rand Paul (Senator, KY) to stop these anti-health food policies. With the wrong leaders, we get more negative rules like this that the government decides what we can or can’t put in our bod. Having grown up with dairy farming grandparents, I can tell you that they never drank a cup of pasteurized milk in their long lives. There was always a pitcher if milk in the refrigerator that came straight from the teat. I don’t know of any dairy farmer who drink pasteurized milk, because that would be spending money on something you get for free. People have been drinking it for millennia and the human race still exists. Seriously, in a country that eats way too much processed food…raw milk is the least of our problems. I grew up in the country and for the most part raised my children in the country. I have one daughter that I used to catch out with our mare and foal milking her and drinking it! Not only did she drink milk straight from goats the neighbors milk cows also! She is the healthiest one out of all the children. Never gets sick. Pasteurization and milk laws are just another government control. I grew up on raw milk, but we always kept it cold in either the milk house or refrigerator. The reasons for Pasteurization include killing the bacteria that makes kids sick and extending the shelf life of the milk to get it from the farm to the stores. When I was a kid mastitis was rare and you would not drink or sell that milk. Today mastitis has spread throughout the U.S. dairy herds and has to be treated before people can drink it. I don’t know anything about goat milk and what their milk bacteria level is like, but cow milk can be dangerous for children. As far as I am concerned, though, let the adults drink what they want. Raw milk has NEVER existed in human history! Well, at least that’s what the pasteurization industry’s well-paid lying demagogues keep all of the foolish mind-numbed robots believing. The reality, of course, is that many human populations would not exist today, except for the fact that raw milk was an important part of their diet. Personally, I don’t do dairy; but it’s quite obvious to anyone who does some open-minded research that pasteurization was a money-making gimmick introduced to kill the bugs in the filthy milk produced by big businesses which was killing people (especially children) because it came from cows that were: fed garbage by these evil business-monsters, neglected by these evil business-monsters, and full of diseases due to these evil business-monsters. So, go ahead and buy your pasteurized pus and crap from the mistreated cows that are owned by these evil business-monsters and make them richer if you really want to do so. If you do, you are the one who will have to pay for your sins. Not me. Wow… I had NO idea the milk I drink on a daily basis, and have for over forty years, or innocently fed to our children, could be so “dangerous” or “political.” Thankfully we still have the right to drink pure old-fashioned milk at home! But seems its back in fashion. I agree Mark. I grew up on it and here in tn we can at least buy herd shares or buy it for “pet food”. So if it’s bought for pet-food, once it leaves the farm it’s okay and what happens to it is up to the buyer I assume? But if I’m understanding this right, as long as you own your own cow and are drinking your own milk it’s okay? We do sometimes buy milk at the grocery store if we are short, but it doesn’t taste as good (in our opinion) as farm milk, though farm milk can have an “off” taste at times like if the cows get into ??? whatever g’novvolich pasture is — wild onion? That’s quite common in NC; sold for “Pet food” What you do with it is just your concern. I see it on Craigslist now and then. I fee l the same way about apples and tomatoes, and try to avoid buying ones that I or a friend don’t grow. Might as well eat the cardboard boxes they come in….